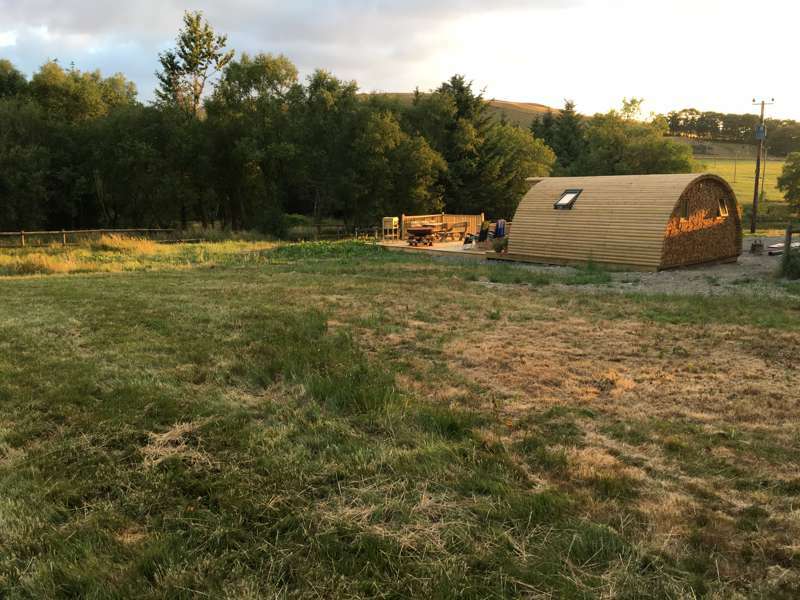 Brynlwyd Glamping is the ideal location for exploring unspoilt mid Wales in the village of Devils Bridge. 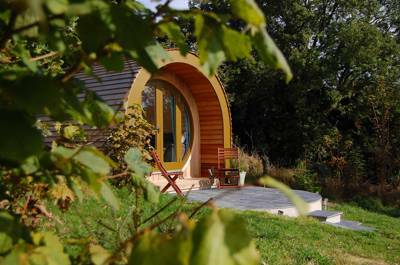 Our Pod can accommodate up to five people and it has its own en-suite facilities. 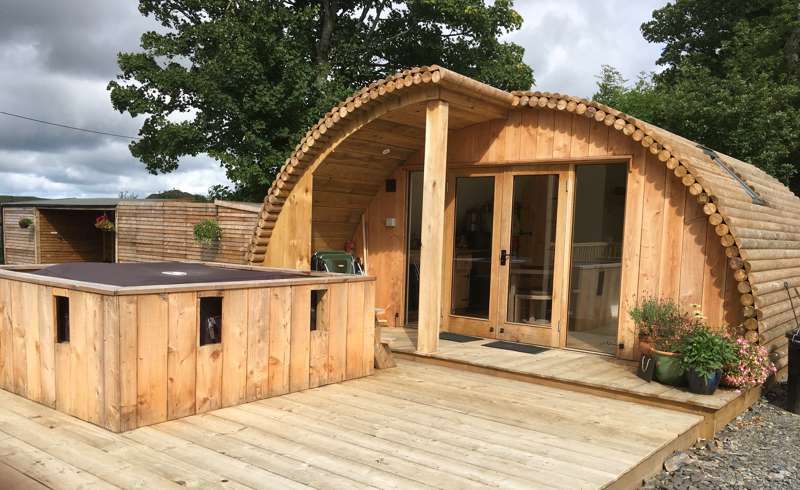 With its large decking area for alfresco dining, hot tub and adjacent a large fire pit for BBQ's and evenings around the fire, it makes it the perfect venue for total relaxation after a good days walking, cycling, bird watching or whatever you choose to do during your stay. The Pod is well equipped, all bedding and towels are provided. the bedroom has a double and one bunk bed. There is a double sofa bed in the living /dining area. The kitchen has an oven, hob, fridge, microwave, kettle and toaster. You only need to bring your clothes. We love it here and we want people to enjoy it too so if you need anything extra to help you enjoy your stay, you only need ask. You are welcome to wander around the lake and enjoy the wildlife, from the bird song in early spring, wild ducks visiting and the Canadian geese who stop over yearly or the beauty of the changing leaves in Autumn. The lake attracts a large number of blue dragon fly, butterflys' and with plenty of seating here, there is ample time to sit and tune in to nature. If you don't want to travel too far afield, you can picnic on the island. There is course much to do during your stay, but simply going for a walk from here will guarantee superb views of the Cambrian mountains. Narrow lanes provide safe walking until you go off track but if you prefer take the lanes a little further afield for even more stunning views on good circular tours. 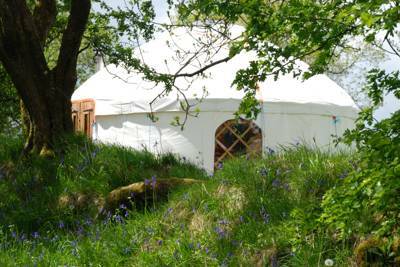 For latest availability and best prices for Brynllwyd Glamping, please use the Date Search above. Pod sleeps up to 5 on a double bed and a bunk bed in the bedroom, plus a double sofa bed in the adjoining living/dining room. En-suite bathroom includes toilet, shower and washbasin. Kitchen features an oven, hob, microwave, fridge, toaster and kettle. There’s a large decking area for lounging or dining. Full use of hot tub included, however this can not always be guaranteed for one-night guests as the tub requires cleaning and heating after each use. Firepit/BBQ (complimentary starter pack of kindling, logs and charcoal provided). 2 electric hook-ups for campervans provided if required (available from 2019 – please check ahead for availability). Large field for games, an acre of woodland to explore and private access to the lake with its own island accessed by a footbridge. All bedding and towels provided. The famous gorge and 300ft waterfalls of Devil’s Bridge are less than 15 mins drive away. Or why not take the narrow gauge Vale of Rheidol Steam Railway (01970 625819) from Aberystwyth. You may not want to leave this handsome Victorian seaside resort in a hurry, laden as it is with bohemian shops and historic sites like Aberystwyth Castle. Take the Aberystwyth Cliff Railway (01970 617642) – Britain’s longest – for an unbeatable bird’s-eye-view of the town. The village of Cwmystwyth is just 4 miles away and home to the stunning Hafod Estate whose grounds offer one of the country’s loveliest walks. Bwlch Nant yr Arian Forest is also close by. Noted for its Red Kite feeding (information and times can be found in the pod), the forest is also renowned for mountain biking trails. Dogs are welcome to and the forest boasts a visitor centre and cafe. Local produce hampers can be pre-arranged for arrival and free-range eggs are also available onsite (providing the girls are laying!). For daytrippers on the steam railway, Two Hoots Café at Devil’s Bridge station serves snacks and hot drinks and can even arrange buffet lunches for large groups (by pre-arrangement). The Hafod Hotel (01970 890232) boasts an extensive menu that ranges from light bites to hearty mains (you may recognise it from the hit BBC detective noir Hinterland). Recently renovated and under new management, The Halfway Inn (01970 880631) at Pisgah is a cracking no-nonsense boozer with a decent line in pub grub favourites. The George Burrow Hotel (01970 890230) and The Druid Inn (01970 880650) also come recommended by your hosts – the latter offers real ales and live music while the former is famed for its stunning views. Use postcode SY23 4RD on Google Maps to bring you direct to the site. From Aberystwyth, take the A4120 to Devil’s Bridge. From the village, take the right turn signed Tregaron B4343. ½ a mile from Turing, turn left before the school signed Trisant. Brynllwyd Camping is 120 yards on the left. Alternatively from Aberystwyth, take the A44 to Ponterwyd. Turn left signed Devil’s Bridge. Go past The Hafod Hotel on the left then take the next left signed Tregaron B4343. After ½ mile, take the next right before the school signed Trisant. Brynllwyd Glamping is 120 yards on the left. The nearest railway station is Aberystwyth, which has plenty of connections as well as bus links. The Vale of Rheidol Steam Railway runs from Aberystwyth to Devil’s Bridge where your hosts are happy to collect (by pre-arrangement only). 1 luxury pod (sleeping up to 5).